We are proud to say that BitCraft has been recognized with the Seal of Excellence by the European Commission. The Certificate has been delivered by the EC as the institution managing Horizon 2020 a programme for Research and Innovation 2014­-2020. Our mobile project under a working title PharmAlert has been submitted in the area of Accelerating market introduction of ICT solutions for Health, Well­Being and Ageing Well. 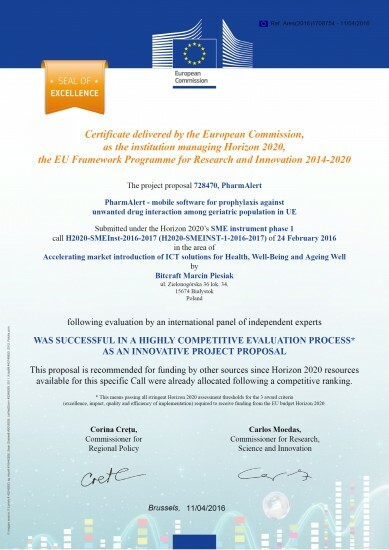 The “Seal of Excellence” quality label is awarded to promising projects submitted under Horizon 2020 which could not secure funding due to budgetary constraints but received high assessment scores in the demanding and independent evaluation process. “For 2014-­2020, €100 billion worth of investments from the European Regional Development Fund will foster research and innovation, including over €32 billion earmarked to support SMEs, startups and entrepreneurs, the main drivers of innovation in Europe. The evaluation screens against three defined criteria (excellence, impact and quality & efficiency of implementation) and identifies those proposals that are considered as meriting funding (above threshold). Going through creating, planning and submitting the project we have bettered ourselves in business planning. So, for future reference, we can gladly help you with your endeavours concerning H2020 but also any of your start­up businesses. We pride ourselves in putting our mind into all of our projects including our own ideas, but what is more important in our clients’ products. While working with us on your next big thing, no matter whether it will be mobile, web or desktop, we can promise to share our spark of ingenuity with you.